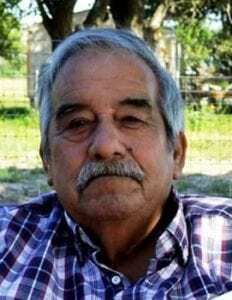 Martin R. Lopez Jr., age 79, of Poteet, passed away Wednesday, April 18, 2018 in Poteet. He is survived by his son, Roberto Lopez and wife Tammie of Fayetteville, Georgia; daughters, Anadelia Mathis and husband Jeff of Poteet, Abigail Lopez of Poteet, Vera Esther Neraz and husband Concepcion of Midland, Adelaida Wellman and husband Lonnie of Columbus, Ohio, and Petra Anderson and husband James of Canyon; brother, Jose Lopez of Rossville, and sisters, Candida Bentancourt of Poteet, and Elida Garcia of Somerset. Martin is also survived by his aunt, Juana R. Felan of Poteet; 25 grandchildren; 40 great grandchildren; two great-great grandchildren; beloved Tio Pipio nieces and nephews, and numerous other nieces, nephews, cousins and a host of friends. He was preceded in death by his parents, Martin and Petra (Rendon) Lopez Sr.; son, Victor Lopez; great-grandson, Emmitt Lopez; sister, Manuela Rios, and brothers, Abelino, Mario and Patricio Lopez. Visitation was held at Lopez Ranch Family Cemetery, off Ditto Road in Poteet, from 10 a.m. until service time at 11a.m., Friday, April 20, 2018. To sign the guestbook visit hurleyfuneralhome.com.